There's a Penneys anchor on the right and a Woolworth store in the center. I believe that's a Sears anchoring the far-left side. There's a really cool interior shot of this mall in my previous Edison entry. Check it out if you want to peek inside this baby. I love those old Penneys stores. They were more alike than different, but they alway had some kind of weird exterior quirk that made them distinctive. Love the brighness of this one! It's cool, Keith. we all have lives. But, um, what about your other blogs? I am missing the groovy colors and wacky descriptions of the motels from hell. WOW, love the blog. 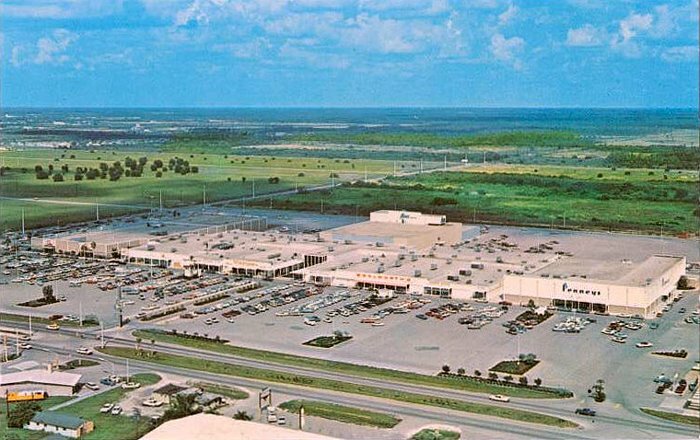 When I lived in Sarasota, I would venture down to Edison Mall. If you were to see the ariel of that intersection now, you would be appauld. It looks NOTHING like your pic. Right now, this mall is going under a renovation. It's actually good, since the previous one (which replaced what the mall looks like in this image) made the exterior of the mall so bland and boring. That center one behind the main entrance looks like a Belk or Burdines. Hey Keith, the ads are back at the board you simply abandoned. Time to delete the thread about it a vanish again! That anchor was recently Burdine's until the Macy's name change. I believe it was Maas Brothers at the time of that picture. Love seeing the old Pennys logo! That's quite an interesting addition they made. And, it looks like they are expanding again. Must be a popular mall! Man just did a sat shot of the mall and surrounding urban area. Man I'm wondering if any wildlife short of a cockroach is still around there. Yes that was a Maas brothers in the center. There was wing added off Penny's with Burdiine's. Then they added another wing with Dillard's . Next Maas became Jordan Marsh, then it became a second Burdines location. Finally the two Burdines became Macy's. With one men's and the other women's.